The convertible tablet space is a tricky one. 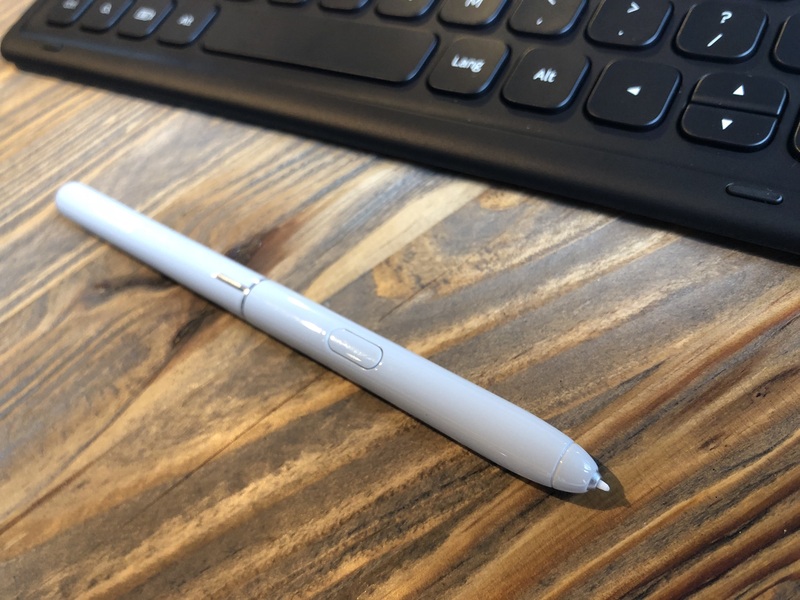 After several years, no one’s managed to precisely nail it — no device will ever manage to straddle the line as the perfect laptop and tablet. But the category is a rare bright spot in an otherwise stagnant tablet market, and Samsung’s never been one to stand down from a challenge. If nothing else, the Tab S4 represents Samsung’s most aggressive approach to the category yet. The company appears fairly confident that it will fulfill the need for both laptop and tablet for a certain segment of the population, at least — which would go a ways toward justifying that $650 starting price. To accomplish this, the company is reinventing DeX. Formerly used to refer to the smartphone docking station, it’s now the name of the company’s desktop mode for Android. DeX is the key to the Tab’s convertibility. The S4 defaults to standard Android mode, switching over to DeX as soon as it docks in the keyboard case. It’s an interesting choice. Rather than go with Windows 10, Chrome or any other operating systems designed specifically for the desktop environment, Samsung’s doubling down on the environment it introduced for the original DeX docks. Why? I suspect it’s a control thing, at least in part. Windows 10 would have required surrendering more functionality to Microsoft (not the mention the consistency complications of the Android-centric Galaxy brand). With Android, Samsung can effectively run roughshod over the operating system as it sees fit. That means, no doubt, the eventually addition of things like the S-Pen’s Air Command interface and other proprietary Samsung differentiators. I took a Chromebook as my sole computer on a recent trip to China. As such, I feel pretty confident in speaking to the limitations of attempting to rely on apps that aren’t optimized for desktop mode. It’s not impossible, but it’s certainly clumsy. When you launch them, they open in a small window. You can make them full screen, but have to restart them in the process. I suspect the discrepancies won’t be as pronounced on the 10.5-inch as they would be on, say the Pixelbook, but there are still some kinks to work out. That includes the fact the Play Store doesn’t specialize in desktop apps, which cuts out a certain number of speciality programs. In my case, I had the damnedest time trying to find a fill in for Audacity, so I could edit podcasts on the 13 hour flight (cue the emails from 800 developers telling me that they have the solution). The good news on this front is that Samsung has worked with some key developers to offer up programs in the “App for Samsung DeX” section of the app menu. The biggest here is Microsoft, which worked with Samsung to create a DeX version of Office. There are some other key apps here as well, like Tripadvisor. For things like games, on the other hand, you’ll mostly be stuck running the mobile version. The Tab S4 represents an interesting sort of cross section of a number of different Samsung offerings. The Galaxy Tab line meets DeX, with a side of S-Pen, which is large and optimized for the bigger form factor. There’s a slot for the stylus on the side of the keyboard case — a nice touch that has been absent in a number of these kinds of devices, including ones from Samsung itself. I can never figure out what to do with that damn pen when I’m not using it. Live Messages — the animated Gif drawing app introduced on mobile — is here. Air Commands are present in Android mode as well. That they don’t carry over into DeX mode feels like a strange sort of oversight on Samsung’s part, but the company tells me it’s something they’re considering, so there’s that. 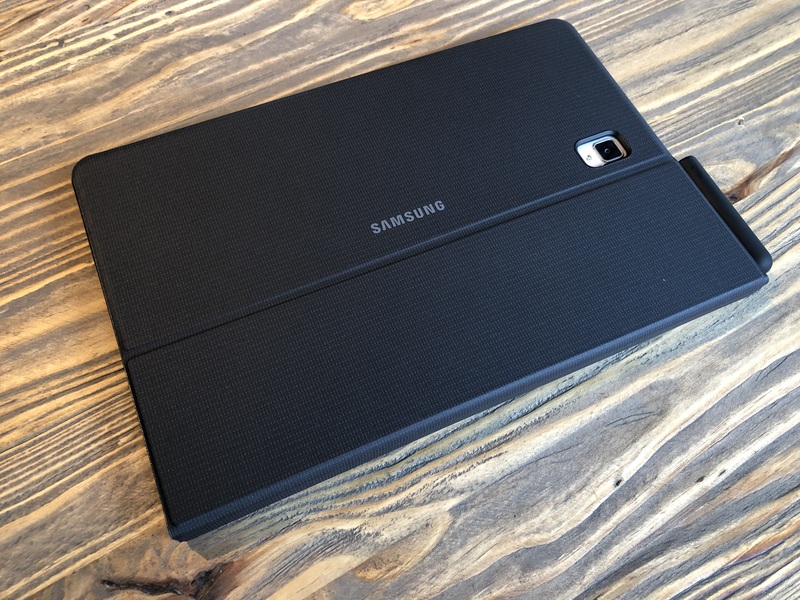 Also interesting is the absence of a trackpad on Samsung’s keyboard case. Touch and pen functionality are the primary methods for cursor manipulation here. I suspect that will ultimately serve most users just fine, but you’ll have to re-program your brain a bit in the process. When your hands assume typing position, habit draws them down to the trackpad, like some peripheral version of a phantom limb. The keyboard is pretty okay, so far as keyboard cases go. I honestly prefer it to the kind of soft version you get with a Surface. There’s more tactile feedback here, and the keys are raised. They’re soft but springy. I’m in no rush to replace my full-time laptop with the device, but I write words for a living. For those whose typing is largely limited to Facebook updates and email, it’s probably just fine. It’s also worth mentioning that the case is robust enough in keyboard mode to actually sit in your lap without collapsing. Not every convertible can say that. Surface Go, I’m looking at you. The battery is a bright spot here. At 7,300mAh, Samsung says it should get you around 16 hours of video playback. That seems like a fairly optimistic estimate compared to the 10 hours Apple quotes on the 10-inch iPad Pro but at the very least, it should get you through just about any flight. The rest of the specs are pretty solid as well, including an octa-core Snapdragon 835, 4GB of RAM and either 64- or 256GB of storage, plus expandable memory via microSD. You can also get the Tab with built-in LTE (for an added cost/monthly fee, of course). That should serve you pretty well for most of what you need to do tablet or otherwise. The port situation, on the other hand, is another pain point for replacing your desktop outright. There’s the Pogo dock for the keyboard and a single USB-C — so good luck with those accessories. Of course, you can also just get Bluetooth mouse — Samsung makes one of those specially for the Galaxy Tab, naturally. The WiFi version of the Tab S4 arrives August 10th, along with the Verizon LTE version. Other carriers (Sprint and US Cellular) will get their models at some point later in Q3. Pricing will likely vary, based on carrier. 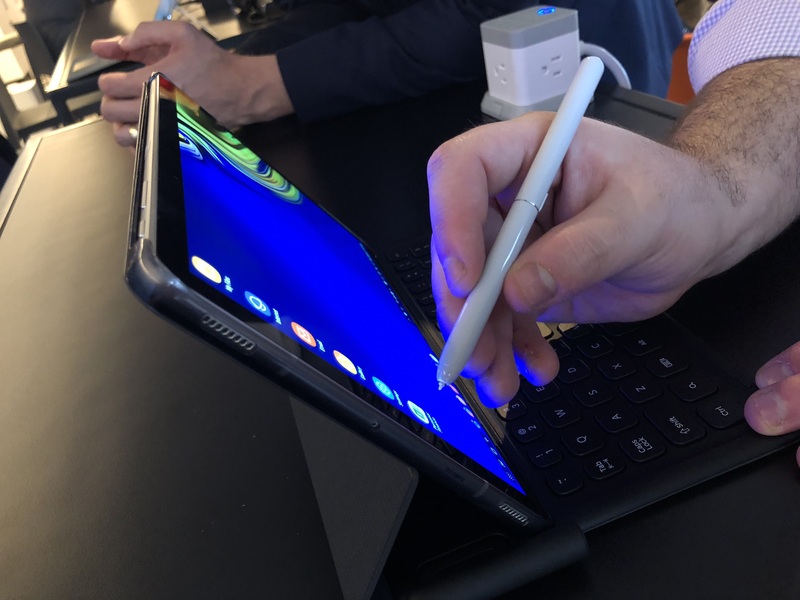 The Galaxy Tab S4 isn’t quite the end-all, be-all laptop replacement, Samsung was no doubt hoping for, but it does represent an interesting new paradigm for the company in the wild world of convertible tablets.